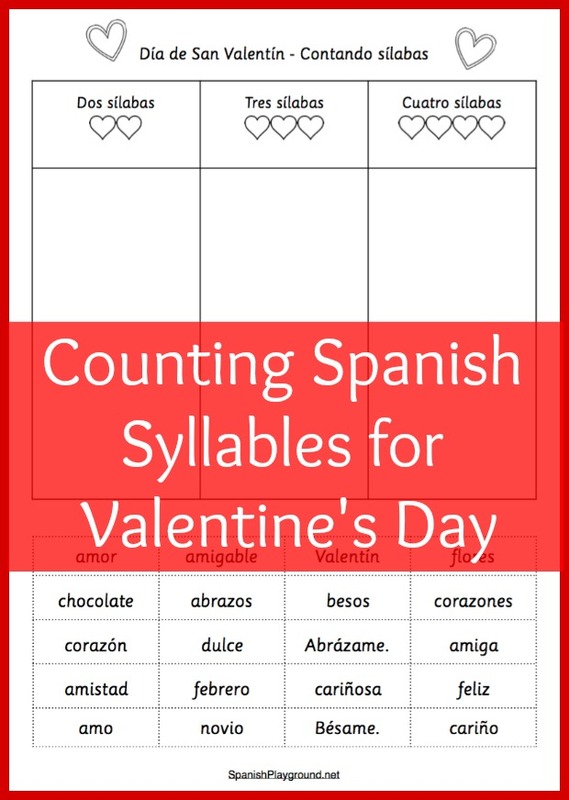 I made this Spanish syllable counting activity for Valentine’s Day, because I wanted an easy, quick way to practice pronouncing Valentine’s Day vocabulary again. You can download the activity below. El Día de San Valentín has words that we use when we talk about emotions, celebrations, family and friends. I love that the holiday has a tradition of cards and conversation hearts – so many opportunities to reinforce language! 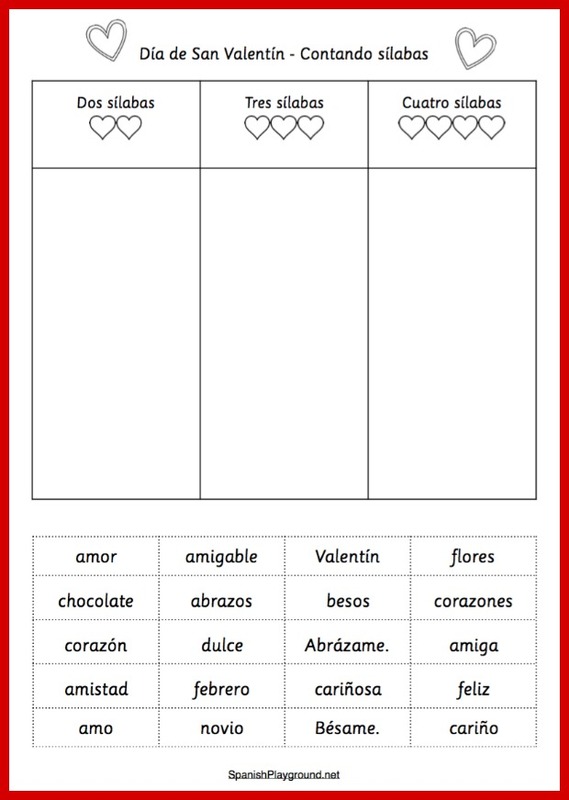 Be sure you look at this list of Spanish Valentine phrases to use in cards and crafts, and these easy Spanish Valentine activities also use vocabulary we associate with the celebration. This Spanish syllable counting activity is a good follow-up to making cards or using the words in questions and conversations. I also use this vocabulary in games, like this Spanish Valentine game with silly rhymes. This pronoun-verb pairs practice uses a Spanish game for Valentine’s Day, too. The Spanish syllable counting activity below does not use the words in context, so be sure that you use them in sentences and make them meaningful. You might want to try some of these easy Spanish Valentine crafts. To do the Spanish syllable counting activity, kids cut out the words and paste them into the correct column. They can also write the words in the correct column, dividing them into syllables when they rewrite them. They have to pronounce the words correctly to know where to put them, of course. We practice clapping syllables and doing actions for each syllable on a regular basis, so this is familiar to my students. If it isn’t something you do, be sure you pronounce the words together and help them hear the syllables. Novio is the only word with a diphthong (a 2-syllable word, pronounced no-vio). All the rest are very straightforward, even for beginning learners. 3-syllable words: corazón, amistad, Valentín, abrazos, amiga, febrero, cariño, Bésame. Download the Spanish syllable counting activity here.